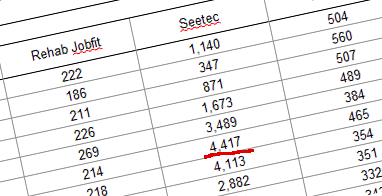 Since publishing revelations that Seetec called the DWP benefits hotline to sanction 4,417 people in one week. Today the DWP released more horrendous stats showing Seetec sanctions targets that by far outstrip all other Work Programme and Mandatory Workfare Activity Providers seeking to make unemployed people destitute, rather than ‘support’ into work. @refuted that's my point. Ingeus had a much smaller amount of total claimants. But a higher percentage of sanctions.